Moalboal is laid back little town in Cebu. At Panagsama Beach, located on an peninsula near Moalboal town, the mixture of expatriates and visiting divers from all over the world living together with the friendly Filipino residents of Moalboal creates quite a unique community. 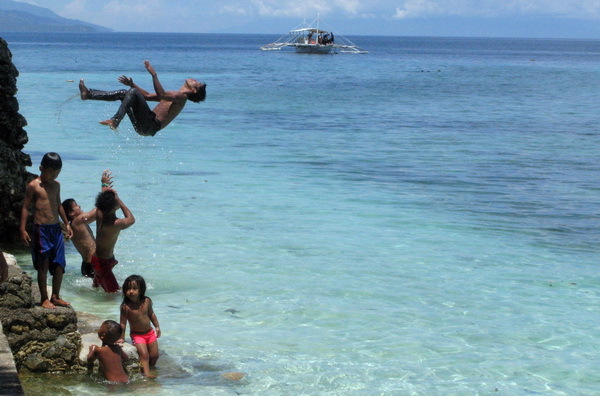 Moalboal is foremost known as a place of great diving. The sleepy town lies on the west coast of Cebu, about 92 km south of Cebu City. You can cover the distance in about 2 1/2 hours by car or bus. Panagsama Beach is the place you want to go, and it’s about 4 km from the town center. Here in Panagsama, the mixture of expatriates and visiting divers from all over the world living together with the friendly and unspoiled Filipino residents of Moalboal creates quite a unique community. Plenty of resorts, guesthouses and bungalows, native and modern, offer you a wide array of possible accommodation in Moalboal. Just to name a few: The Savedra Beach Resort, overlooking the sea, Pacita’s with its lovely native nippa huts, Hannah’s Place and Restaurant with good seafood and nice accommodation, Cabana Beach Club Resort with first class accommodation and good food. For eating the Last Filling Station is the choice of many of our divemasters, instructors and divers. The numerous restaurants offer you a wide variety of cuisines, especially freshly caught seafood. On an extended weekend dive holiday you can try one restaurant or canteen per day and not have to go to any place twice. Several nightspots, like Chili Bar, Beach Bar or Roxy, offer pool billiard and darts, sometimes also live music. Chief Maui and Lloyds offer additional dance floors for hot disco nights. Diving in Cebu is good all year round. The visibility is not much affected by the seasons, ranging anywhere between 10m on a very bad day and 30+m on good days. So, in our opinion, we can not really recommend a special month where diving is best. Cool & dry season (December to February) – Temperature in daytime is around 32C. Temperatures in night time drops to 23 – 25C. There are occasional rain showers. The water is a bit cooler, 26 – 27C. Hot & dry season (March to May) – Temperature in daytime about 32C. It does not cool off very much in the evening; you can expect also 30 – 32C during most of the nights. The water is only a bit cooler, 27 – 29C. It rains very seldom, sometimes not in weeks. Rainy season (June to November) – Temperature in daytime about 32C. Cebu and the Visayas have not a strong rainy season. Usually it’s bright sunshine in the morning and a short but strong and refreshing downpour in the afternoon. After that, sunshine again. Water temperature is 27 – 29C. Between September and December the Philippines are sometimes hit by typhoons. These typhoons follow a regular path, which leads over the islands of Samar to Luzon ( Manila ) further on to China , Hong Kong or Japan . Cebu is outside this typhoon belt but sometimes we are affected by overcast and some rain for a couple of days. From the airport take a car to Moalboal. The most convenient way to get to Moalboal is to let us arrange your transfers. We provide reliable aircon cars. If you are up to some adventure, you can hire a taxi in Cebu City or at the airport. Be prepared for some bartering and some hidden costs, like to pay for the gasoline at the gas station. If you are really adventurous, take a taxi (insist on meter) to the Southern Bus Terminal in Cebu City. The driver should take you to the LIBRANDO or CERES bus terminal; a bus to Moalboal leaves about every full hour (Filipino time). Once in Moalboal, take a tricycle to Panagsama Beach. In rare cases a tricycle driver might take you not to the resort or dive center you requested, because he gets a commission from another resort. So be persistent. If you are in Moalboal and for any reason you (or your taxi driver) have to ask for the way, don’t ask for Savedra, because Savedra is also a secluded beach far away and people might send you there. Ask always for PANAGSAMA BEACH. Panagsama has no big sand beach but rather a rockier beach which quickly gives way to a coral reef abundant with marine life. There are plenty places nearby Panagsama that offer picturesque tropical sand beaches for sun worshippers. White Beach is about 8 km from Panagsama and can be reached by tricycle, mountain bike, motor bike or boat. Zaragossa Beach on Green Island, a kilometer of finest sand beach, can be reached within 20 minutes by boat or land transportation.